Warning – this is a mundane race report ahead! Nothing exciting to see here! Every so often, after entering a race on a “spur of the moment” decision, there comes a realisation that if it is more difficult to get to & from an ultra than to do the race itself, I probably need to choose my races with a bit more care. This race was a fairly simple 45ish miles, from outside London to inside. It started in somewhere called Wendover, and finished at Little Venice, just a hop, skip and jump from Paddington. 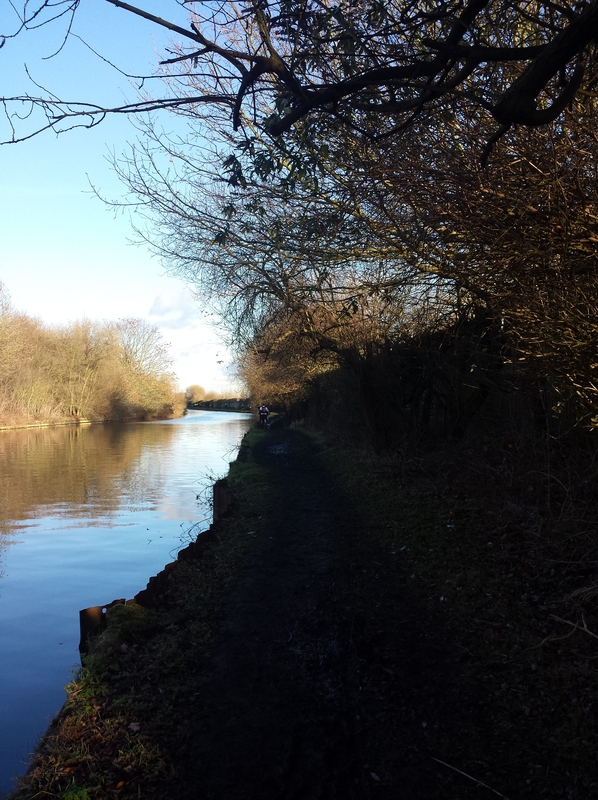 Lots of trails, a bit of canal path…..it sounded right up my street. Training wise, naturally I’d done a few 20 milers, but not a great deal more in the weeks leading up to it. After all, it was only 45 miles right? d) find a supportive wife who would ferry me back & forth and meet me at the finish with a Cornish Pasty and a beer. Friday 6pm – leave work, drive to Central London, whilst eating pizza for much-needed sustenance. Fri – late – Get into room, book taxi for morning, pack rucksack for morning, eat crisps. Sat – early – Jump out of bed, check weather, eat cereal, get taxi (a posh Merc, with the driver telling me how it was going to snow, me telling him not to be daft, it bloody wasn’t). So at about 7.45am, I arrived at the superbly named, ‘Shoulder of Mutton’ pub in Wendover, where there was a hive of activity in the car-park. It was bloody cold, so I quickly got inside, and the pub was surprisingly big, filled with a ton of lycra-clad excited people…imagine a kid’s party, just moments before they are let loose on the soft-play area, with all the nervous energy sparking round the room…it was magic. Registration was painless, but ahead of getting myself organised with race numbers and stuff like that I thought I’d pay a visit to the facilities before they got too busy (ah, the voice of experience there, I hear you thinking). These people don’t know what is going to happen if they sit down….. 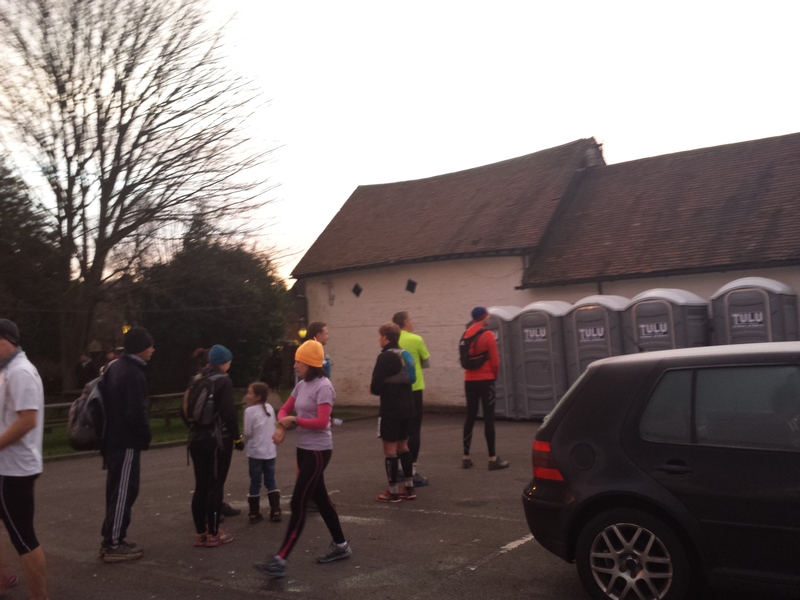 There was a bit of a queue for the gents, which wasn’t particularly unexpected, until a nice man popped his head round the door and said to the queue that there were some toilets outside that were available. I went out to them, and it rapidly became clear why they were free…peeling my frostbitten bum off the seat of an outside portaloo in sub-zero temperatures was an experience I’ll not be repeating any time soon. However, I got back inside the pub and sorted out my kit. We had been given a rather posh map booklet as part of registration, and once again I was reminded that I’d really not done my homework for this run – not only did I not know where I was starting (yes, I was in Wendover, but that doesn’t mean I could find it on a map) but I did not know the route – and there were lots of people studying the map booklet like it held the secret to Atlantis. My strategy was (as usual) to follow the people in front, and failing that I had the route on my slightly unreliable Garmin, and failing that I have my phone with a sat-nav on it, and if the battery on my phone died I was carrying a spare battery, so what could go wrong??? The pub was filling up rapidly, and an 8am train from London brought a ton of people into an already rather full pub. Everyone was getting on well though, as we all tripped over each other rucksacks. I was (as always) amazed by the differences in how much some people were taking with them. I had enough food for at least three days, a raincoat, a head-torch, and lots of other useful things, but I’m sure there were some people there that had just a toothbrush in their pack and that was it. I watched them enviously; thinking how unprepared they clearly were for any situation, and hoped I would get a chance to use my bear-repellent spray for once. Overcome with excitement about possible bear encounters, I went out to check my bag in, for transporting to the finish line, and collected my timing chip. A novel idea for me, to have a timing chip for an ultra, but to be fair there were some very quick people there so it probably was warranted. And while I was outside it started snowing. Oh good. Quickly back inside the pub, I was trying to keep warm, and looking outside to see if the snow was going to stop. Which it wasn’t. Someone shouted in the pub that we should all start to move outside, and a shuffling mass of people started to move from a cosy warm interior to a sub-zero snowy car park, without complaining. Just standing outside at the start for a couple of minutes I was shivering badly, and although I knew I’d warm up quickly when I started running, I was very aware that slowing to a walk later on would be an issue as I would get very cold very quickly. experience (clearly some first-timers and some very experienced people (and their toothbrushes)), some people in shorts and short-sleeved t-shirts whilst others were dressed for the Antarctica. But everyone was excited and ready to get started. And then we were off, with a bit of a “3,2,1….” from a tannoy subtly mounted on top of a car. The first few miles were mix of trail and path, luckily much of the mud had been frozen solid so what would have been a very wet experience actually was quite dry. 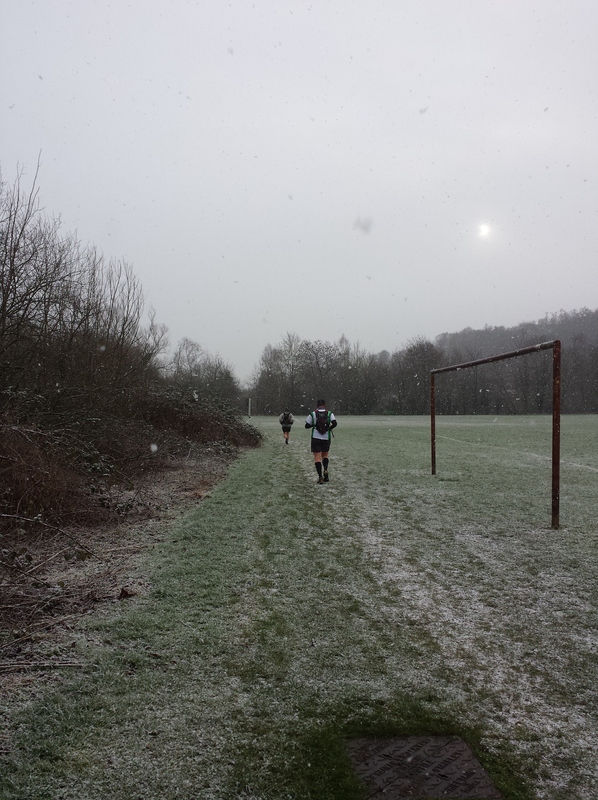 There were a number of very muddy parts later, but I suspect we were all saved by the frost. 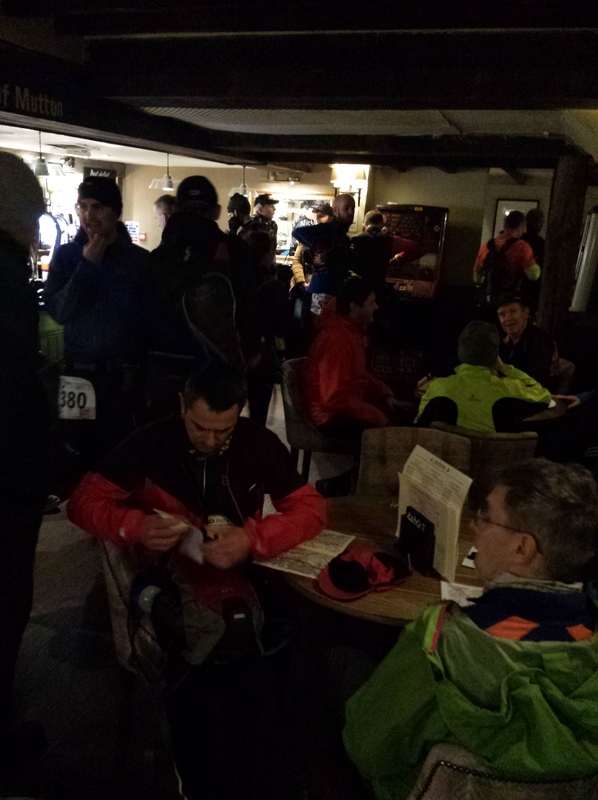 Everyone was very chatty, and I was having a bit of banter with a few, about how those guys running The Spine had very similar conditions to us (snow, a few hills, a bit of cold). If you don’t know what The Spine is, google it. If you do know what The Spine is, you’ll know what I’m talking about. An unbelievable race. 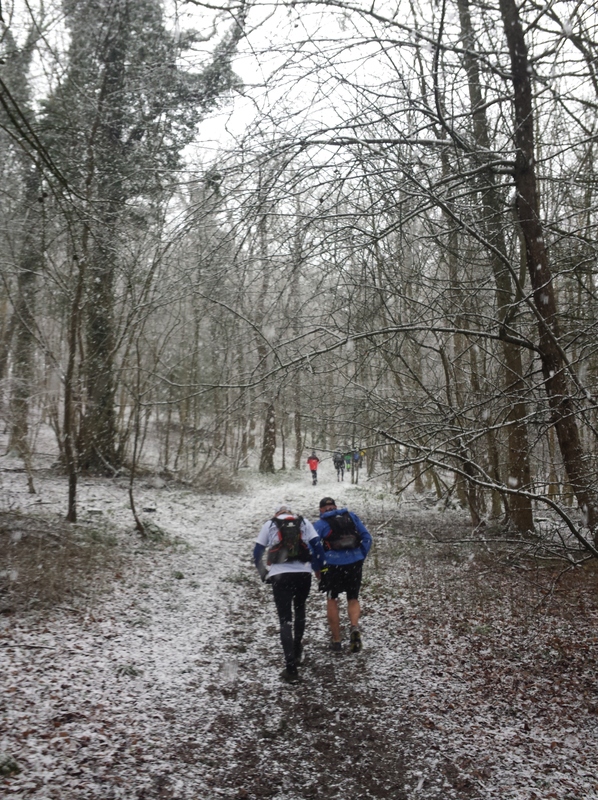 It was still snowing reasonably hard, and I was chatting to a runner that was running Marathon des Sables in April. There seemed to be quite a few using the C2C (as the Country to Capital is known) as a training run for MdS, with a similar rough terrain, although perhaps just a little bit cooler. playing field with plenty of kids playing organised football. There were a few tough parents on the sidelines, who must have been freezing, but due respect to them for getting their kids outside in some pretty rough conditions. Just after this playing field there was a small stream, with a set of about 10 round stepping stones across the middle. There was a slow chain of runners gingerly picking their way across these slightly-frozen slippery rocks, and occasionally slipping in. Always keen to test how good my waterproof socks are, I sploshed through the water, which was surprisingly refreshing, and I must have gained at least 5 places. Naturally, all those people (with dry feet) caught me up straight away, but I was happy as I dripped my way along the path. I think it was about mile 16 when I started to fall apart. My left hamstring has been a problem for a while, and usually can get me to 20 miles with a bit of pain but not much else. Due to the nature of the trail I suspect I was putting more strain on my muscles than usual, and hence was feeling sore. I was scraping my left foot along the ground, rather than lifting it clear, which was a clear sign to me that I was hurting. Not even being halfway, I started to have a few negative thoughts about the whole running activity, as there wasn’t really the option of walking the rest of the course (like I did in the Winter 100) as it was fecking cold and would be very dark at 5pm. 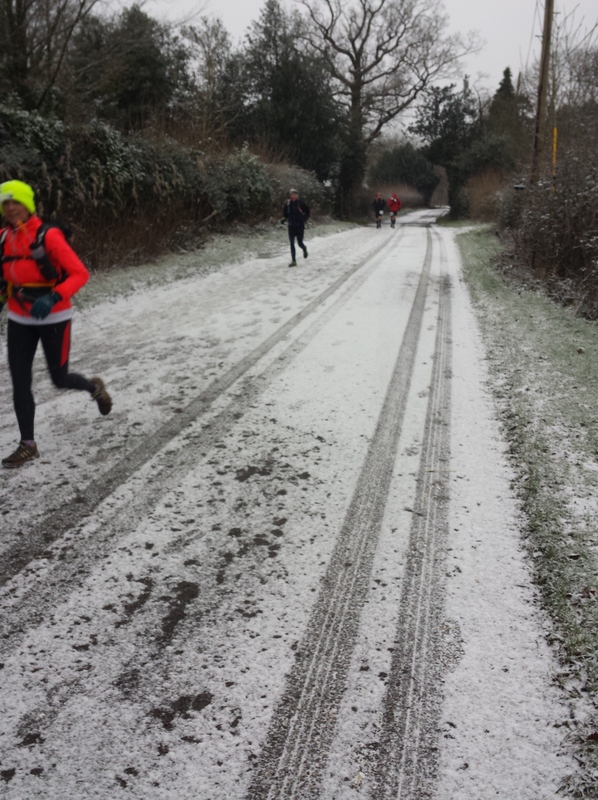 A snowy road, and a luminous runner…. Very similar to the W100, I brought out my secret weapon, and started sucking a Sherbet lemon to get my mood up a little. As I slowed, there was a heck of a lot of people going past me, which was really dispiriting. I’m a very average runner, and don’t get fussed about my position or anything like that, but I was feeling rough at such an early stage, it didn’t feel great watching a constant stream of people bounding past me. Just before the second aid station (at about mile 20ish) I tried to wade through a particularly big puddle that stretched from one side of the road to the other. Everyone else was gingerly creeping round the edge, but (in my invincible waterproof socks) I tried to go on a slightly different route, and had that sinking feeling of a puddle going a lot deeper than I expected. With a bit of swearing, I turned into a leaping gazelle and bounded the last 6 feet without touching the ground. The second aid station had copious amounts of water (and some electrolyte tablets and powder which I thought was great) but not a great deal in terms of food other than cake. Whilst I was OK with this, carrying a few tonnes of groceries with me, I wonder of there were a few people feeling hungry at this stage. 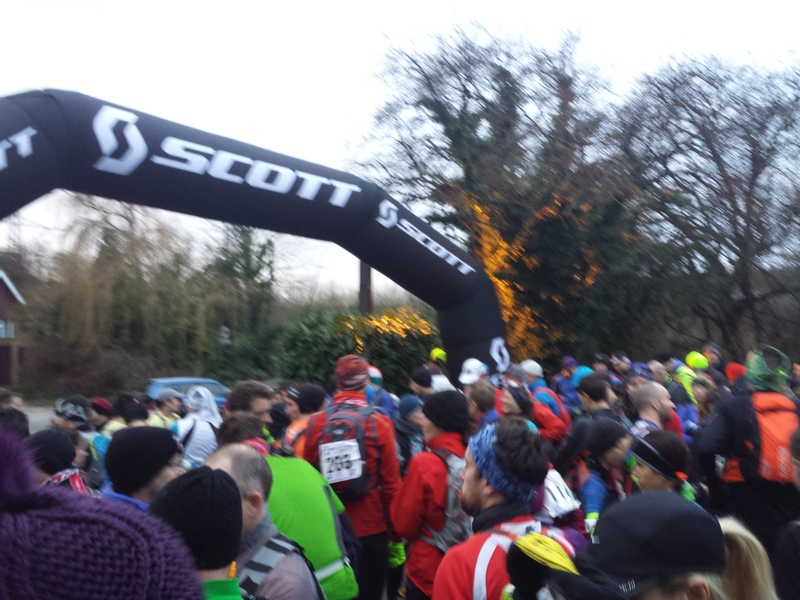 Having said that, I think the other aid stations later on seemed to have more food available. All of the checkpoints had loads of superbly cheerful marshalls, and although I didn’t stop for long, the marshalls were great at cheering you up. I was now onto what I will call the ‘hilly’ stage, which was simply an uphill (walked) followed by a downhill (run) and repeated endlessly. The downhills were quite steep and were a bit of a challenge, especially the few that had previously had a small stream running down the middle, baring the pebbles, and a sloping mud bank on either side. The stream-bed was too narrow to run in, and the mud-banks were too sloped to stay on, so the only way to get down was to bounce from one side to another…exciting running! Somewhere about mile 22, I had my first real food, half a tin of ravioli. There are some people out there that will find it unappetising to eat freezing cold ravioli out of a plastic bag, but luckily I’m not one of them. Yum yum yum. ‘Nuff said. A bit of food inside me (even if it was cold) got me going and I meandered along to about mile 30. At some point (I don’t remember when) we turned right onto the Grand Union canal path, which improved the footing a lot, and felt (after the GUCR last summer) like coming home. Lovely blue sky at the canal! We turned left at the Paddington signpost for the last half-marathon, and it was here something rather strange happened. Usually, at this point of any ultra I’m completely pooped, without the energy to break into a run or even want to. However, I started to feel a bit livelier, and started running for longer and longer periods. Still tired, but not shattered. Very odd. Awesome! I then just listened (with a few encouraging noises) as he told me some amazing stories (including running in the setting from the book ‘Born to Run’). I’ve met a lot of inspirational people while running, but this guy was exceptional (and very humble with it). That made the miles pass quickly, really really quickly, and before I knew I was on the last few miles. I was feeling great and pushed the pace on as I knew I was finishing soon. The last couple of miles were quite gloomy as it was just going dark, and I couldn’t really see the finish before I got there, but I went through the line at last, and got a handshake, medal and a very efficient man gave me my time on a scrap of paper (8 hours 26 if you’re interested…the winner managed it in 5 hours 7 mins, so I’ve got a little way to go before I start troubling the front-runners). There were a lot of people at the finish, getting changed or just sitting, but I knew I couldn’t hang around if I was going to get back to my car quickly. So after a cup of coffee and a few thanks to various people, I got my phone out and sat nav’d the 0.6 miles back to the car. I suspect I made a strange spectacle, walking through Central London with a rucksack and dropbag, dressed entirely in black lycra, but I wasn’t too fussed about that. In the car I pretty much inhaled a couple of Cornish pasties (my food of choice for post-ultra snacking) and set off into the London traffic. Interestingly, my clutch control in the stop-start traffic was appalling, as my left leg was jellified by the run and now had pretty much no pushing power. Anyway, after a couple of hours driving I got home safely, and after a quick shower and a ton of sausages and mashed potatoes, I was off to the works Xmas party….Merry Xmas! I need to see a physio about my left hamstring; it’s not going to fix itself. I always take far far too much stuff when doing these bloody runs, and I never need it all – as enjoyable as it is to carry lots of ravioli around races with me, I need to take the right amount rather than the maximum I can carry. There are some awesome people out there to talk to, and there is so much more to life than the mundane. Life must be savoured & enjoyed. Always wear waterproof socks. They are magical things. And I think that’s it for another cracking run! A few days later my legs are stiff, (my left especially) but I’m in one piece and still smiling. I’ve got a few more ultras in the coming months, before my big event of the summer – the Thames Ring 250 – which will be something new and interesting…. a whopping 250 miles across 4 days, seeing how little sleep I need and how much food I can eat. Exciting times! Thanks to all at Go Beyond Ultra for a cracking run, I’m already looking forward to the Thames Trot in February.